If you have not heard of The Natural Beauty Box yet (or if you have missed my many reviews of this amazing UK business), definitely take a minute to check out this fab ethical subscription service -- this is one that never disappoints! What is The Natural Beauty Box and what does it offer? Well, "each month there is a new theme with eco-friendly co-ordinated packaging to match and products will always be worth over £50," plus every single item is chosen for its quality so you can be guaranteed that what you receive is luxurious and effective. 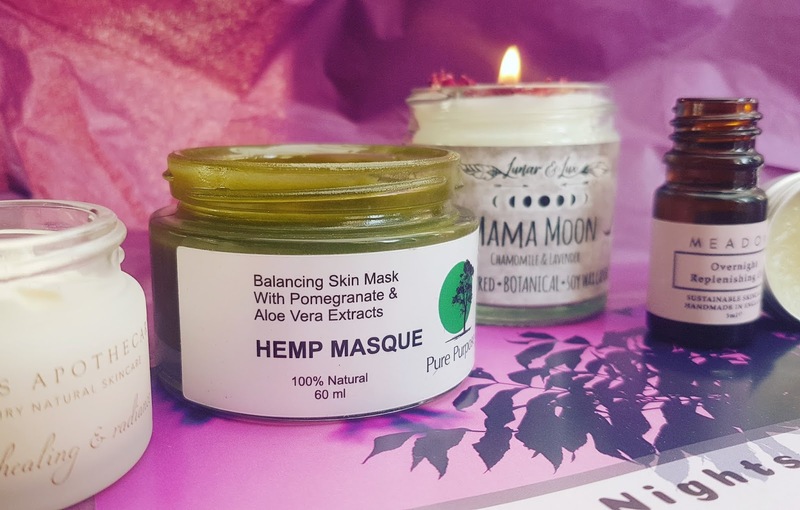 The contents are always from eco-luxe British brands, are cruelty free, vegan, and all natural, and these goodies are truly treats that are guilt free and deliver the perfect pamper! 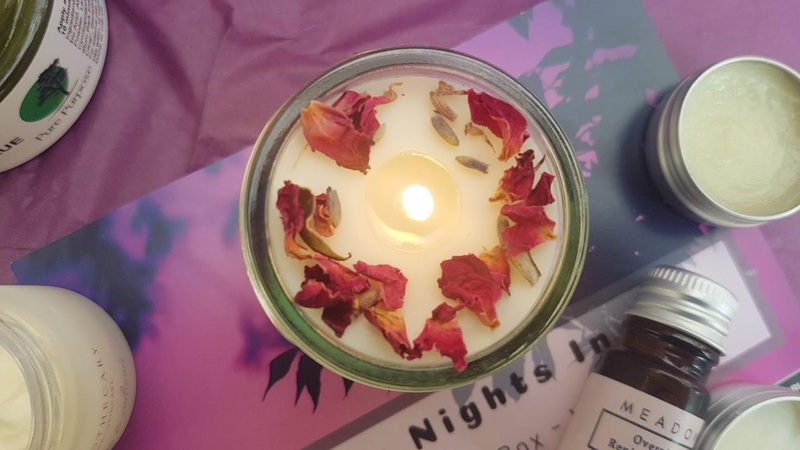 The January "Cosy Nights In" edit was curated to provide a blissful experience indoors during these cold and dreary winter days, and was packed full with skincare and aromatherapy treatments that will help you unwind, relax, and indulge in some much needed self care! With seven items worth £60, subscribers will find themselves with a new face mask, candle, facial oil, cleansing balm, hand and body lotion, body souffle, and beauty balm. And as always, the representation of brands is above and beyond -- of the seven treats included in this collection, two are brand new names to me and I have not tried a single one of the products themselves! No other box brings as many exciting and unique surprises as The Natural Beauty Box, and I love knowing I will always discover something new whenever the next collection lands at my door. This hand poured vegan soy wax candle is absolutely stunning in every way. The label on the front is very mystical, and I love that this is plastic free (glass jar and tin lid!) -- but the real magic starts when you untwist the seal. You are greeted to an immediate 'wow' moment, as the dried petals and lavender give a beautiful pop of colour and soothing fragrance that really pulls you in. With chamomile and lavender essential oils, this blend has soothing your spirit and body on the mind. The aroma is deeply calming and helps you unwind after a long day at work or a stressful day at home, and I find it the perfect addition to my evening routine. After removing the botanicals (and stashing them in my 'petal pot') I lit my Lunar & Lux candle and settled in for a cozy evening. I loved the warm glow that flickered on the mantle, and it was mere minutes before the scent started to fill the whole room! But want to know my absolute favourite things about this Mama Moon candle?? a) it is nontoxic - since it is made with pure soy wax, a cotton wick, and pure essential oils, there are no nasties being let off so you can breathe with ease and not worry about headaches or other negative symptoms that occur when you burn a synthetic candle! 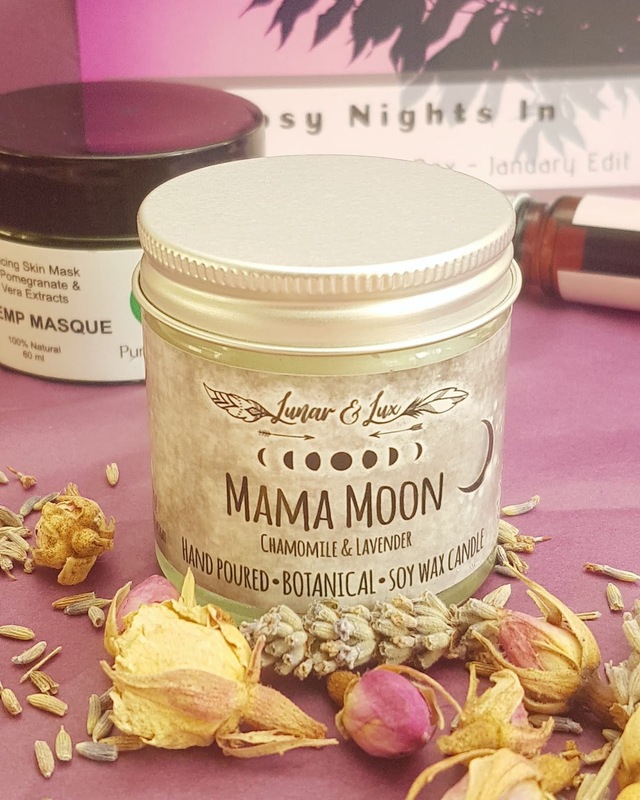 b) it is affordable - many eco-luxe candles can be a bit out of my price range, but even the full 17oz size version of Mama Moon is under £25! I can't wait to get hold of one of these beauties, as the bigger sizes burn far longer (~ 40 - 50 hours apparently!) and also come with charged and saged crystals for even more positive energies. Until then, I will be enjoying this try me size and loving every second of it! 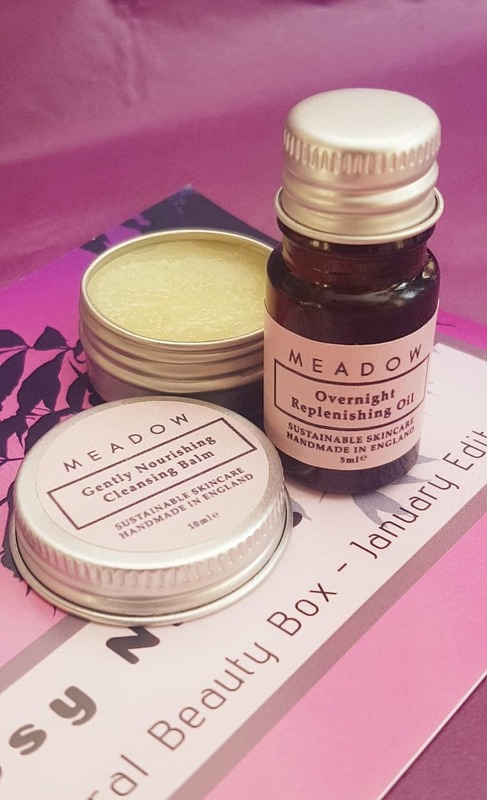 I discovered Meadow almost simultaneously with the announcement that their Gently Nourishing Cleansing Balm and Overnight Repair Oil would be making an appearance in January's edit of The Natural Beauty Box, so I was thrilled to get to try out their products so quickly. This vegan brand handcrafts their range with sustainability in mind, meaning that all of their products come in plastic free packaging (even their samples!). With four products currently available, Meadow has created skincare rituals that "target modern day worries including pollution, pigmentation, sun damage, toxins, ageing and dehydration," and subscribers of The Natural Beauty Box get to benefit from these thoughtful formulas. The Gentle Nourishing Cleansing Balm is ideal for removing makeup, dirt and debris that has built up over the course of the day, and environmental toxins, and is ideal for most skin types. The product contains a variety of butters and oils that work to nourish, decongest skin, give a glow boost and a dewy look to the face, and offer anti-inflammatory properties, meaning this cleansing balm brings some serious benefits. I love how soft and velvety the texture is, and how easy it is to apply -- the balm glides across the skin and you don't end up using much since a little goes a long way. It's not overly heavy like some other balm cleansers can be, and washes off with a muslin without any hassle. Plus, it smells incredible and the whole cleansing experience turns into an uplifting aromatherapy moment as the grapefruit and lavender essential oils work to melt all your worries away. As for the Overnight Replenishing Oil, this product is again suitable for most skin types as it is gentle and full of healing ingredients like watermelon and tomato seed oil, prickly pear oil, and rosehip oil. The scent is incredible, with light jasmine hitting the nose first followed by a hint of more grounding frankincense and calming lavender -- perfect for nightly use as it really works to reduce anxiety and stress! The oil sinks in quickly and does fully absorb, and I found this ideal for those nights where my skin clearly needed some extra TLC. I personally can't use this every night as it is a tad too heavy for my semi sensitive and congestion prone skin, but have found it the perfect addition to my skincare routine after a detox mask or a day out in the windy and wet air. I will say Tim's skin drinks the stuff up though, and his complexion has been much more radiant and his skin far less dry since using Meadow's overnight oil. I can't help but feel a little envious as I love this oil and wish I could use it more often! I'll definitely be watching closely how my skin reacts as I continue to use both Meadow's Gently Nourishing Cleansing Balm and Overnight Replenishing Oil, and I can't wait to see the results after finishing these little samples. I have to say this is the product I was most intrigued by when I saw it would be included in the Cosy Nights In edit. The colour looked so unique and gorgeous, and I just had to know what it felt like on the skin! Since I have previously used two green goodies from Pure Purpose (their Tumeric and Orange Coffee Body Scrub and Mask + their Deodorant Cream), I knew that I would be in for a treat. Well, I was not disappointed, as the Hemp Masque turned out to be an almost spa-like experience! 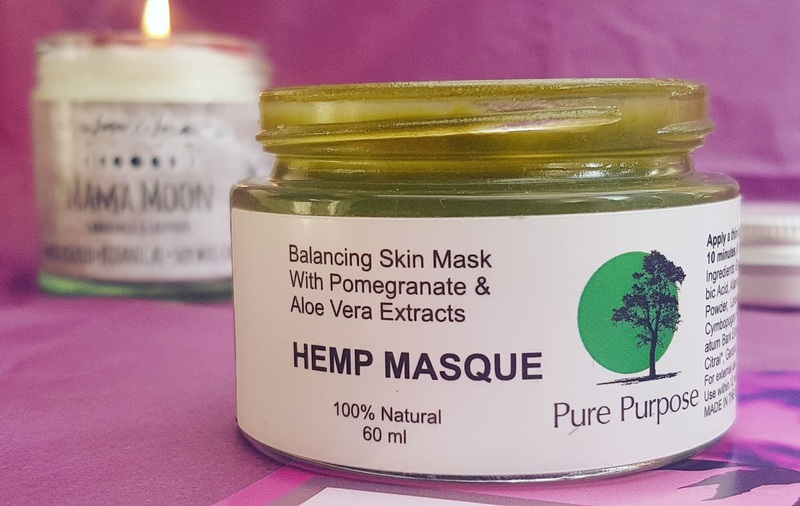 Pure Purpose's Hemp Masque is a non-drying face mask that is designed to provide a balancing and moisturizing treatment to the skin. A deep green, like a cross between the emerald skin of the Wicked Witch and a damp forest, this formula is like nothing else I have tried. It is glossy in texture, and surprisingly thick while also being easy to manage, plus has a scent that contrasts with the appearance which makes for a great surprise -- boldly zesty, full of citrus notes like lemongrass and grapefruit and something a little more sharp (perhaps the rosemary? ), this face mask is just sensation after sensation! 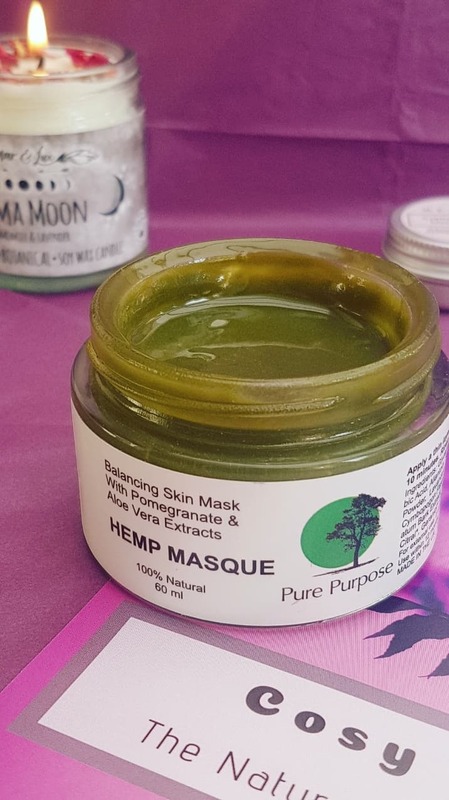 I definitely need more time with this Hemp Masque before I can give my full thoughts on it, as I have only used it a few times which is not enough to give a proper review -- so I will definitely be giving an update once I have had time to see results! What I can say is that so far this face mask has been a rollercoaster for me, as it breaks all my expectations (in a good way! 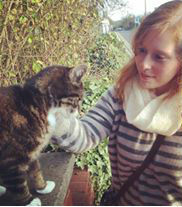 ), and I cannot wait to see how my skin gets on with it long term! My only complaint is the ingredients are not listed on the product listing, which you all know is a pet hate of mine. Since I am familiar with the products already, I knew the ingredient list would most likely be suitable for me prior to receiving the item, but I refuse to buy an item without full disclosure of ingredient prior to purchase. That being said, I have copied the full list below for others to reference! I have to admit I have mixed feelings about this product -- I do really like Green People and think they are a fantastic brand (due to their ingredients, status as a leading brand in the natural beauty world, and their accessibility/affordability), but I also have a general dislike for lotions. I don't like 'wet' products, as I find they take a long time to dry down and do not usually offer the same level of nourishment as oils, butters, or balms. I do find this to be a good little bottle for on the go, either in your handbag to help soothe sore skin while at work or out shopping, or for when you are travelling. I like the multi-purpose aspect of the product as well, as it makes it super handy and cost efficient! I just don't find it nourishing enough for my hands or body on its own. BUT, I found a little hack that seems to be working great for me! Rather than applying as a standalone product, I have been using the Quinoa & Calendula Hand/Body Lotion as a sort of serum, using a small amount as a base and then applying a heavier duty product on top to lock in the moisture. I have to say my hands and feet have especially been loving this tactic, and have looked much healthier and felt a whole lot softer since starting this method. I also love the scent of this product -- the lemongrass and ginger aroma works to boost your mood and is very warming and uplifting. I have actually used a few of the other goodies in the Quinoa & Calendula range, including the shampoo, conditioner, and shower gel, and have enjoyed them, so if you are like me and like the aroma but just aren't super keen on lotions, I highly suggest you check those out. I adore Lola's Apothecary - this natural beauty brand creates products inspired by the magic of Devon, and I have to say every single one I have tried has been incredible. I first stumbled upon their wellness tea (which is delightful), then their Delicate Romance body souffle which blew me away (and ended up being one of my top ethical beauty product picks of 2018!). So when I saw that the Sweet Lullaby Body Souffle would be making an appearance in the Cosy Nights In box I was thrilled to bits! "Reveal your body radiance with this soufflé of whipped Shea Butter, Coconut Butter, Camellia Oil and Rosehip CO2 Extract for gorgeously smooth skin. Intensively nourishing and protective, perfect for both dry winter skin and as after sun treatment." 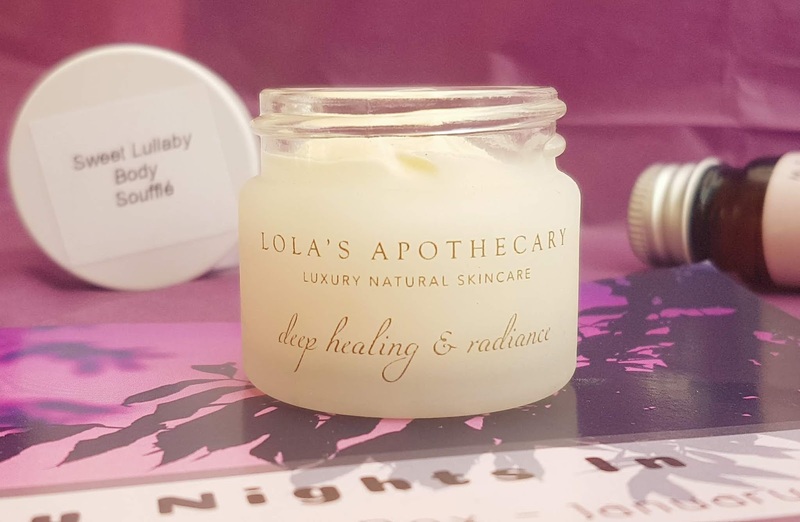 The texture of Lola's Apothecary body souffles is out of this world - it is unbelievably lightweight, and has an airy quality to it that is unmatched by any body product I have tried. However, despite how delicate the meringue-like butter is, the consistency is incredibly nourishing. The souffle melts down instantly on contact, and leaves no oily residue behind. Somehow they have created a fusion of a lotion and a butter, and it provides everything my skin craves. Every time I use their souffle, I am left feeling like silk, and so so so soft. But would you believe me if I said that wasn't the best part of this formula?? The scent. The scent is pure bliss! It is difficult to describe, as the aroma is complex and constantly evolving, but let me try... Rich vanilla, ylang ylang, sweet lavender -- these are the essential oils that dance on top of the fragrance for me, and it truly is like the "hug in a bottle" the product describes itself to be. It brings back a feeling of happy nostalgia, and totally lifts me up and leaves me smiling. This may be my favourite find from this edition of The Natural Beauty Box, and I will have to save up my pennies to buy the full size at some point because I can't imagine not having this in my life anymore -- it is just so perfect! Ingredients: Butyrospermum Parkii (Shea) Butter, Cocos Nucifera (Coconut) Oil, Camellia Oleifera (Camellia) Seed Oil, Prunus Amygdalus Dulcis (Sweet Almond) Seed Oil, Rosa Canina (Rosehip) Fruit Extract, Lavandula Augustifolia (Lavender) Flower Oil, Pogostemon Cablin (Patchouli) Oil, Cananga Odorata (Ylang Ylang) Flower Oil, Citrus Aurantium Dulcis (Sweet Orange) Peel Oil, Tocopherol (Vitamin E), Vanilla Planifolia (Vanilla) Fruit Extract, *Limonene, *Geraniol, *Linalool, *Farnesol, *Benzyl Benzoate, *Benzyl Salicylate, *Eugenol. *From essential oils. I was very happy to see Made By Coopers would be included in the Cosy Nights In Box, as I have been using their Atmosphere Mists regularly for a few months now and was keen to try something new from their range. 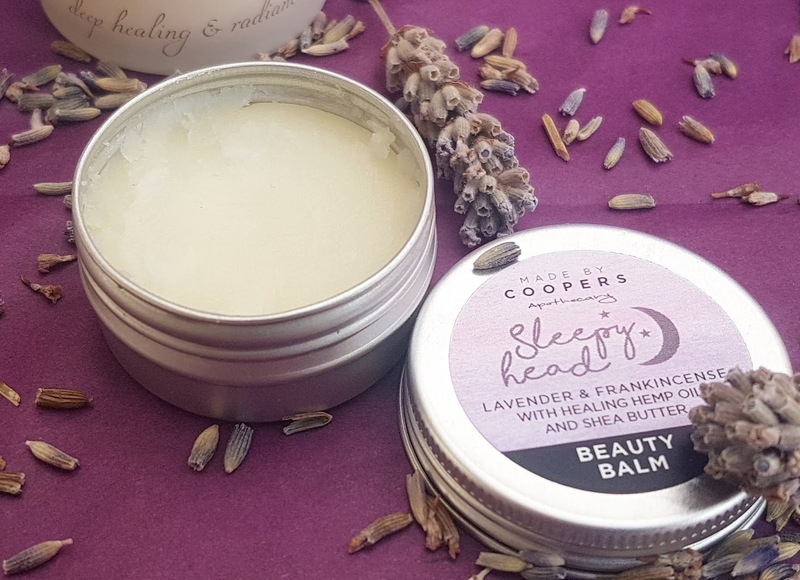 The Sleepy Head Beauty Balm is a multipurpose product that can be used on the face, body, cuticles, and more, and it comes in an easy to carry tin (no plastic in sight - yay!). I love how compact the packaging is, as it means I can take this with me on my travels and always have a pre-bed treatment ready to help lull me to sleep. 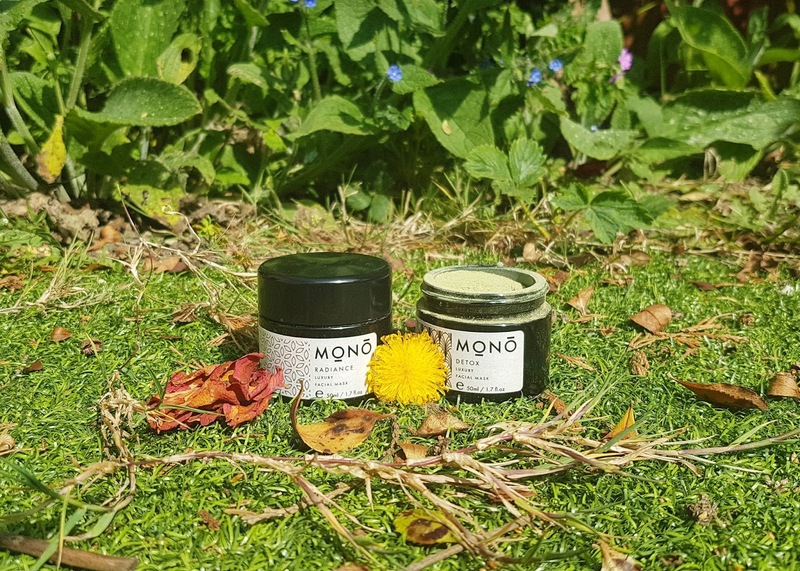 The balm itself is very easy to work with once you warm it up a little, and you only need the smallest amount as it is so nourishing and incredibly fragrant. One little swipe and your senses will be greeted by frankincense and lavender which slowly wash over you and leave you feeling totally calm and at peace. If you're feeling overwhelmed or cannot seem to quiet your brain in the evenings, just take a whiff of this and you'll be more relaxed in minutes. Talk about a potent product! I have been loving this on my wrists and temples before cozying up in bed, and find it really helps me get a more restful night's sleep. I love natural sleep aids, and it is great to find one that is a solid product rather than a liquid. I can pair this with a pillow spray if I need extra tranquility, or just use it on its own during my nightly routine. Either way, I am guaranteed to feel less tense! And since the balm contains hemp oil and shea butter, it is a great little healing treatment as well! If you have cracked skin around your nails, rough patches on your skin, or areas that need some TLC, you can pop a bit on, massage it in, and let the antioxidants fight free radicals, slow the appearance of fine lines, soothe chapped skin, and smooth everything out. 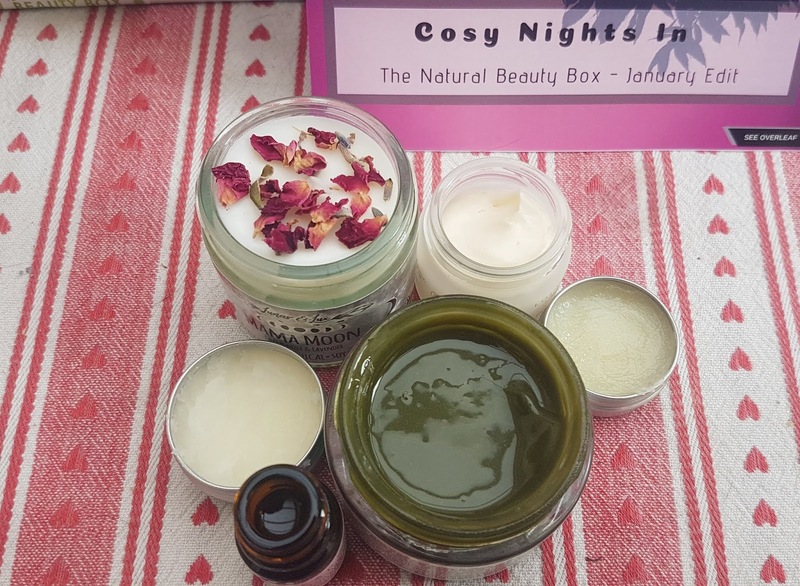 So that was the January "Cosy Nights In" collection from The Natural Beauty Box! I was so happy with everything, even the lotion which I normally would just gift on, and have been spending lots of nights totally blissed out and feeling totally at peace thanks to this curated box of pampering products! 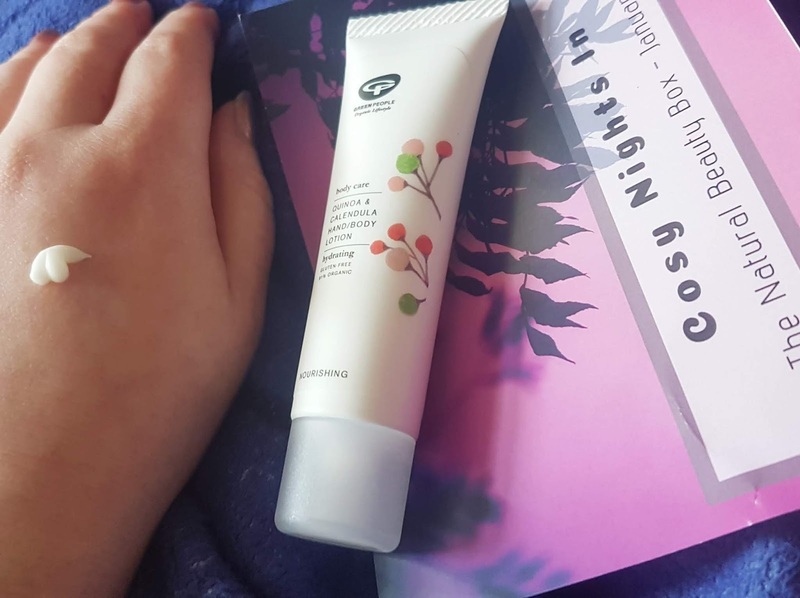 The "Cosy Nights In" edition of The Natural Beauty Box is one more example of how Emma ups the game with every new release. I am always lost for words when I first open this subscription box and this time was no different. The box was packed beautifully as always, and I was so happy to discover so many new brands and products. The January collection is worth £60, meaning as a subscriber you have saved more than double the cost on these seven ethical skincare treats. The Natural Beauty Box continues to deliver exceptional value month after month, as well as incredibly high quality green goodies. And not once have I been unhappy with the contents -- how rare is that?!? This is one box I won't be cancelling anytime soon (or ever!). So what did you lovelies think of the January box?? Did you have a favourite product, were you head over heals for one of the brands, or were you just blown away by it all? Share your thoughts in the comments - I always love to hear what you think! And if you are looking into subscribing, be sure to do so before the next edition sells out. Each month there is more and more interest and the boxes sell out fast! Don't worry though, you usually have time to see a few spoilers of the upcoming theme over on The Natural Beauty Box's Instagram account before you have to decide if you are still a little unsure. But when you are ready, remember to use this link to grab 10% off your first box! This sounds like an absolutely fantastic box! I love getting to try new products and the fact this is all natural is a huge plus. I hope you don't mind me asking but how much is it to subscribe to? Sorry if you mentioned it but I re-read a couple of times and could see mention bar it was less than 1/2 the cost of the RRPs? I really enjoy using Hemp products and my hair is so frazzled lately, I'd love to try out this hair masque. This sounds like such a fantastic box and I love the cosy night in theme. That Mama Moon candle looks great, I am a sucker for candles! Great review! I've tried this box before and really enjoyed it; I'm really into natural skincare. The only thing I hate getting though is natural deodrants-I use the spray ones (sukin has a good one)but can't get on with the other ones! I've never heard of this box much before, but it certainly looks like you got some really great items.